Quarry Ridge has a total of 12 trails ranging from beginner-friendly singletrack to advanced downhill lines. 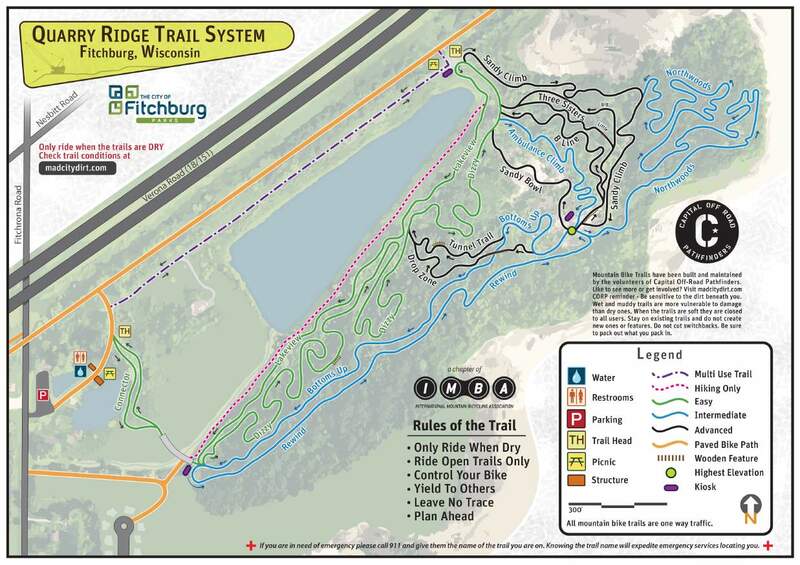 The trail system was significantly expanded in 2013, and most of the trail was rebuilt in 2014 and 2015 with the addition of many jumps, berms, and wooden features. The total trail system mileage is approximately 4 miles with 40% easy, 25% moderate, and 35% advanced singletrack trails. This is a FREE park thanks to the City of Fitchburg. Please heed all posted trail signs, we strive to keep this park fun & safe for riders of all skill levels. Check out the Quarry Ridge Cross Country Loop map, photos, and GPS track available at MTBProject. Beginner Loop: Dizzy and Lakeview, combined together, form a 1.5 mile loop of easy trails. Cross-Country Loop: Ride Dizzy, Lakeview, Rewind, Northwoods, Sandy Climb, and Bottoms up in order. This forms a 3.2 mile fast loop. Downhill: Three Sisters, B. Line, Sandy Bowl, Tunnel Trail, and Drop Zone are all advanced downhill trails. Riders can return to the top via Ambulance Climb, Sandy Climb, or Lakeview to Rewind. Connector - Easy - 0.1 miles: A short connector trail from the parking lot to the main trails. Dizzy - Easy - 1.0 miles: A twisty trail with minimal elevation changes. This trail will test your cornering skills. At higher speeds, the trail can be quite a challenge. Two wooden features are located on this trail, several berms, and beginner-friendly optional jumps. Lakeview - Easy - 0.5 miles: A fast return along the lake to the start of Dizzy and Rewind. The trail is slightly downhill from start to finish, making it a quick and fast ride. Rewind - Intermediate - 0.5 miles: This trail is the easiest way to the top. The trail has a moderate grade with a few tight switchbacks. Bottoms Up - Intermediate - 0.5 miles: The easiest way back down! Bottoms Up is the original downhill run and is still one of the best. Expect a fast ride with many corners and twists and turns around trees. Sandy Climb - Advanced - 0.3 miles: The original climb named after the sandy trail surface. Much of the sand has been removed, but it is still an advanced climb due to its steepness and technical features. Northwoods - Intermediate - 0.8 miles: The newest trail. The trail downhill and uphill segments with bermed corners and ravine crossings. The trail ends part-way up Sandy Climb, returning you to the top. Ambulance Climb - Advanced - 0.2 miles: The climb has two routes. The original climb goes straight to the top following an old dirt road. It is short and steep, averaging close to a 20% grade. Although not technically challenging, it will test your fitness! The newer route is all singletrack with several switchbacks to reduce the grade. Three Sisters - Advanced - 0.2 miles: This trail is a single trail for about 40% of the run, and then it splits onto two wooden drops and two dirt jumps. The line to the right with dirt jumps (Big Sister) is a more advanced and fast line with larger features. The two wooden drops towards the left lead to a twisty trail (Little Sister) with seven berms in a row with jumps in between and a line of tabletops at the end. Where's the third sister? It was torn down, but may be added back in the future. B. Line - Advanced - 0.2 miles: Parallel to Three Sisters is a newer trail (2014) that rides down the hill through a ravine. Expect many large berms and jumps. Sandy Bowl - Advanced - 0.2 miles: A rugged entry trail leads to an open sandstone bowl. This area is an open space with numerous line combinations for your choosing. Tunnel Trail - Advanced - 0.1 miles: Fast, twisty, and fun. Three tabletops lead to a ravine with natural berms, machine-built berms, and a wooden wall ride. Drop Zone - Advanced - 0.1 miles: New in 2015, this trail crosses over Bottoms Up on an elevated wooden drop. This trail is the most advanced and contains difficult obstacles and is only recommended for the most experienced riders.